6/30 Cup of Coffee: Thursday had a full schedule on tap, and included plenty going on throughout the organization. Pablo Sandoval and Eduardo Rodriguez made rehab appearances at Pawtucket and Portland, respectively. 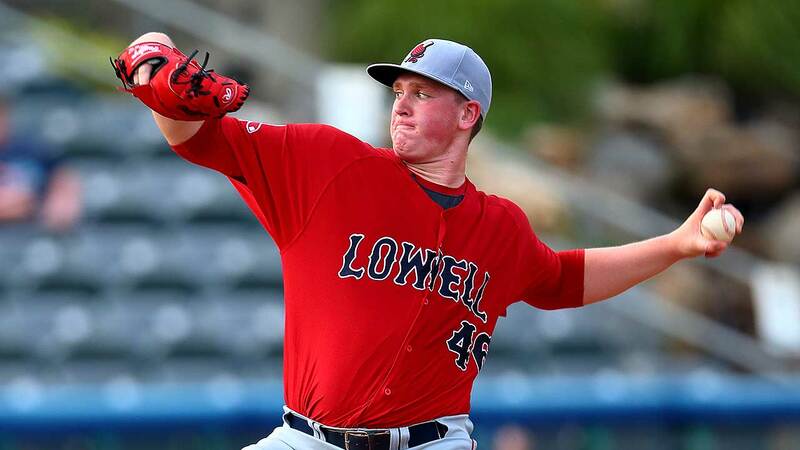 Jay Groome (pictured), officially on rehab with Lowell, fired five innings of no-hit baseball. Among the many 2017 draftees making professional debuts was second-round pick Cole Brannen, who started in center field with the GCL Sox. Salem and Greenville both prevailed in long extra-inning contests, with Salem winning in the 14th and the Drive in the 12th. The PawSox got their revenge on former top overall pick Mark Appel (PHI), who dominated them in a start 10 days ago. Pawtucket's offense cranked out 14 hits, including three off the bat of much-maligned rehabbing third baseman Pablo Sandoval. Brian Bogusevic scored three times as part of his 3-for-5 night, and a double by Bryce Brentz was his 16th extra-base hit of the month. Marcus Walden continues to do vital work in the PawSox swingman role. Getting the start Thursday, he allowed two runs (one earned) in four innings, striking out six against one walk. Edgar Olmos struck out seven in three innings of relief. Help keep SoxProspects.com free! Please consider making a contribution to our annual donation drive. 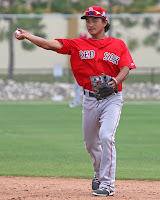 On the latest episode of the SoxProspects Podcast, Chris and Ian dove into a wide array of topics, including the promotions of Michael Chavis to Portland and Tzu-Wei Lin (pictured) to Boston, as well as plenty of post-draft coverage. 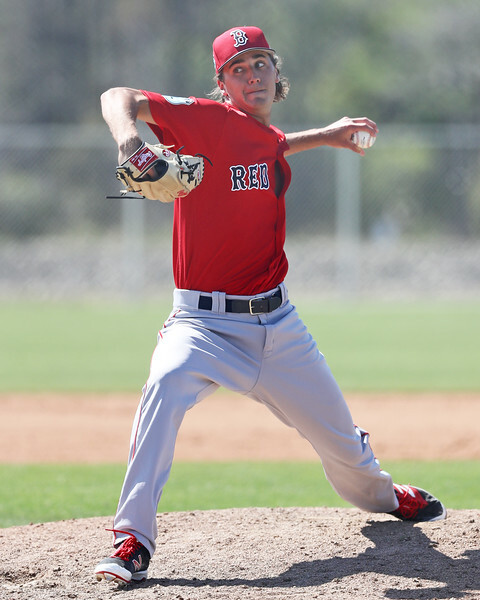 SoxProspects Director of Scouting Ian Cundall wrote up his latest Scouting Scratch, taking a look at several Pawtucket pitchers. They included Henry Owens, Jamie Callahan, Brandon Workman, and more. The confounding 2017 season continues for Henry Owens as the former 2011 first-round pick was demoted to Double-A Portland. WEEI.com spoke with manager John Farrell about Owens' control and mechanics struggles. 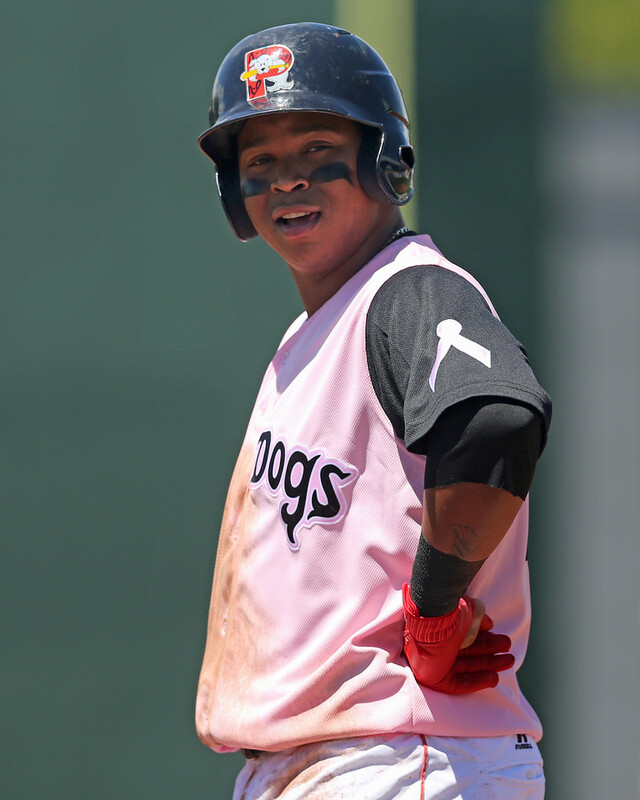 6/29 Cup of Coffee: Both Rafael Devers (pictured, right) and Michael Chavis showed off their power against consensus top-100 prospect Sean Reid-Foley, with Devers launching two home runs while Chavis added one. Jhonny Peralta made his debut as the designated hitter for the PawSox, and Dedgar Jimenez finally stumbled after a tremendous June. After allowing 10 runs in his last start, Kyle Kendrick allowed six runs on five hits over two innings last night to take the loss. Ty Buttrey was also hit hard, allowing four runs on five hits over two innings, while Noe Ramirez went three scoreless innings. 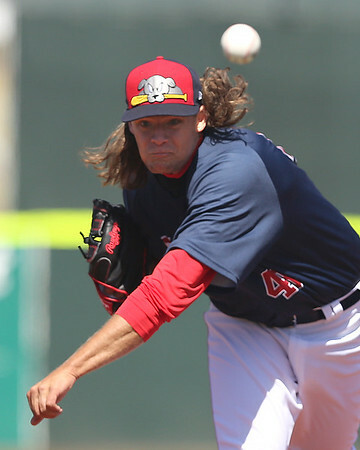 Buttrey's ERA now sits at 10.80 over his first 10 innings with the PawSox. PAWTUCKET, R.I. -- In today’s Scouting Scratch, we’ll feature notes from a two-day, four game stretch in Pawtucket on June 17 & 18 against Rochester (MIN). Left-hander Henry Owens was demoted to Double-A on Monday after a string of poor starts with Pawtucket. For the year, Owens has 60 walks in 69 innings, and in his last three starts he has walked 19 hitters in 15 2/3 innings. I was at the second start of that stretch, when he walked four over seven innings. This was a weird outing for Owens, who struggled for the first two innings, then retired 14 hitters in a row. His overall line was seven innings, three hits, two runs with four walks and five strikeouts. It was clear from the start that Owens was struggling with his mechanics. He has been tinkering with them significantly since the beginning of the year including raising his hands at the start and going to a full windup. The Red Sox announced along with the demotion that they plan to drop Owens’ arm slot from high three-quarters to a true three-quarters. At this point, something had to be done—even though Owens had a couple strong innings in the start I saw, it was clear something wasn’t right with his mechanics. Owens long limbs mean he has a lot of moving parts than can be tough to keep in sync. In this outing, Owens was starting on the third base side of the rubber, but his foot was landing on the first base side and pointing in different directions each pitch. His arm was also dragging behind, leading to him constantly missing high and arm-side. 6/28 Cup of Coffee: No one has been able to slow Bryce Brentz down lately, as the 28-year-old righty homered twice for Pawtucket to extend his long ball streak to three straight games. Travis Lakins returned from the disabled list for an abbreviated start for Portland. Bryan Mata faced his first real adversity of the 2017 season for Greenville. The PawSox exploded for a 20-hit attack on Tuesday, led by Bryce Brentz's two-homer performance. Brentz went 2 for 4 with four RBI, three runs scored and two walks. Pawtucket also got great production out of the bottom of the lineup with Heiker Meneses and Dan Butler each driving in three runs. Meneses went 3 for 5 with two runs scored, as well as connecting on his first home run since July of 2014. Pablo Sandoval went 2 for 4 with an RBI and a run scored in a rehab appearance. Shawn Haviland allowed three home runs, but was fortunate they were all solo shots. Haviland allowed four runs on six hits in six innings of work, walking two and striking out seven. 6/27 Cup of Coffee: With the Gulf Coast League season kicking off, Monday was the first day of the year that all seven affiliates were in action. There was some weirdness on the mound, as Trey Ball (pictured) and Hector Velazquez, the two starters at the highest levels combined to walk nine batters and strike out only one in 11 innings, yet gave up only two runs. Shaun Anderson turned in a solid start for Salem, while the defense was Lowell's Achilles' heel for once again. With the score knotted at four in the 10th inning, Bryce Brentz took old friend Pedro Beato deep for his 15th home run of the year. Steve Selsky had homered earlier in the night, his 10th on the season, while Brian Bogusevic had a pair of hits including a double. Hector Velazquez got the start in his return from the major league squad, turning in five innings with four hits and two runs scored, walking four without recording a strikeout. Austin Maddox struck out four in two innings of hitless relief to get credit for the win. The Red Sox added another third baseman to the upper minors last week as they signed Jhonny Peralta to a minor league deal. Peralta, who is a career .267 hitter over his 15 seasons in the big leagues, will help provide depth as the third base situation in Boston is still up in the air. The lack of infield depth also led Boston to promote Tzu-Wei Lin (pictured, right) to the big league roster. With Josh Rutledge being placed on the seven-day concussion disabled list and Brock Holt being moved to the 60-day disabled list, Lin may get a chance for some playing time in Boston. Both Stephen Nogosek and Nick Lovullo were promoted to Salem last week after the All-Star break. Nogosek struck out 45 batters in 35 1/3 innings for Greenville, while Lovullo hit .329/.441/.447 over 76 at-bats for the Drive. 6/26 Cup of Coffee: Despite a rough Sunday in terms of wins and losses, there were several standout individual performances. Jordan Betts capped a monster series to lead Salem, backed by a strong outing by Mike Shawaryn. Michael Chavis hasn't missed a beat since Thursday promotion to Portland, homering in a losing effort. A late rally came up short, as the PawSox missed their opportunity to earn a split in their four-game set with Scranton. A six-run ninth inning pulled Pawtucket to within one, highlighted by a three-run homer off the bat of Bryce Brentz. Jalen Beeks took the loss, allowing five runs on six hits in five innings, striking out five and walking three. Ty Buttrey allowed a run on three hits in two innings. He struck out three and didn't issue a walk. 6/25 Cup of Coffee: Jay Groome had a mixed bag in his second outing with the Spinners. Edgar Olmos continued to pitch well in Pawtucket while Matt Dominguez (pictured) had a big offensive night. Bullpens also pitched pretty well throughout the system. Pitching was the story in this one, as three PawSox combined to give up just two hits. Edgar Olmos had another nice start with five scoreless innings while allowing just one hit with seven strikeouts. He did have some control issues, walking five. Chandler Shepherd and Jamie Callahan each threw two shutout innings, with Shepherd striking out four. Matt Dominguez led the offense by going 2 for 4 with a double, a home run, and four RBI. Blake Swihart had two hits including a double, and Bryce Brentz had a pair of doubles and a walk. 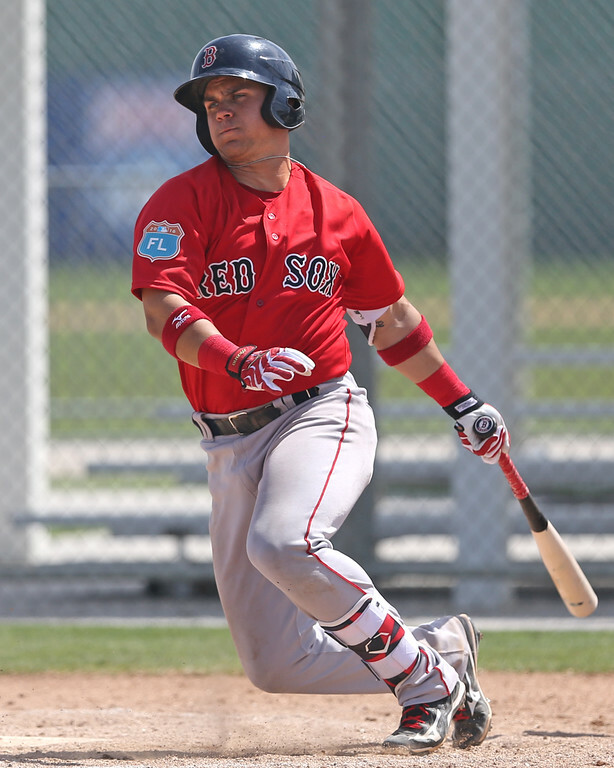 6/24 Cup of Coffee: Portland has quickly become the affiliate to see, as 2017 breakout performer Michael Chavis has joined top prospect Rafael Devers (both pictured) in the heart of the Sea Dogs lineup. Chavis made a quick acquaintance with the Hadlock Field faithful as Portland rolled to a 9-2 win. Lowell also registered a convincing win, while the PawSox slide continued. Salem and Greenville both fell in tough one-run losses. The PawSox have found themselves in a brutal slump. They have lost eight in a row, and have dropped the first two games to rival Scranton by a score of 20-3. Henry Owens struggled, walking eight batters and giving up three hits in four innings, surrendering four runs. Control continues to be a major issue for Owens, who now has 60 walks in 69 innings on the year. Austin Maddox also was roughed up in his return from a brief stint with the major league club. Maddox gave up four runs on four hits in 1 2/3, leading to an ERA jump from 1.32 to 3.52. Brian Bogusevic picked up two hits while getting the start in center in place of Rusney Castillo, who was placed on the DL with a groin injury. 6/23 Cup of Coffee: Coming out of the Single-A All-Star games and with the promotions earlier in the day highlighted by Michael Chavis heading to Portland, it turned into a wild day on the farm. For awhile it looked like Salem's depleted roster would be its undoing, as it trailed 7-2 in the eighth, but a nine-run inning sparked by Bryan Hudson led a stunning comeback. Greenville and Lowell both dropped tough one-run losses, while Pawtucket is reeling right now. Pawtucket continued its midseason swoon, losing its seventh in a row. In the last four games, the PawSox have been outscored by a 29-4 margin. It was a rough start for Kyle Kendrick, who surrendered seven second-inning runs and 10 in total over five innings. Brian Bogusevic spoiled the shutout bid with a seventh-inning solo home run, his fourth of the season. 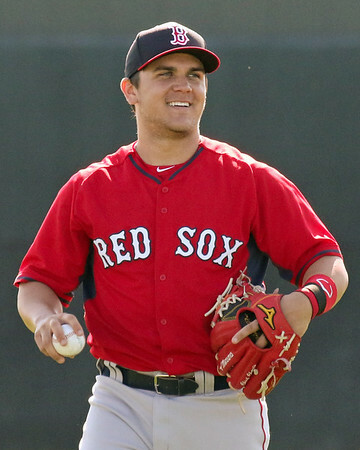 SoxProspects.com has confirmed through sources that the Red Sox are promoting third baseman Michael Chavis (pictured, right) and middle infielder Chad De La Guerra from High A Salem to Double-A Portland. The news was also tweeted by a teammate while we were seeking confirmation. Update: When announcing these transactions on Thursday morning, the Salem Red Sox announced that right-handed pitcher Stephen Nogosek and infielder Nick Lovullo will be coming up from Greenville to fill the vacated roster spots. More on these players below. 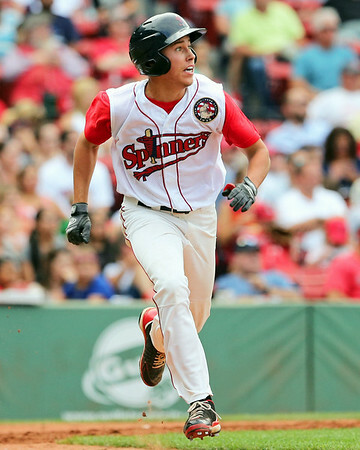 Chavis, currently ranked seventh in the SoxProspects rankings, and De La Guerra, who recently made his debut at number 60 in the rankings, played in Tuesday night's Carolina League All-Star Game, which was hosted by Salem. Both are in the midst of breakout seasons. Chavis, the Red Sox first selection in the 2014 draft at number 26 overall, has easily been the system's best hitter over the first half of this season. After struggling some in his first full season with Greenville in 2015 and suffering through an injury-marred 2016, he has been a revelation in Salem this year, hitting .318/.388/.641 with 17 home runs while playing in a ballpark notorious for depressing home run power. Chavis has already set the single-season record at Lewis-Gale Field with 12 home runs, a stunning number considering that the Salem club hit 18 home runs combined at home in 2016. I have had the chance to see right-hander Ty Buttrey three times over the past few weeks, during which he has had varying degrees of success. Buttrey’s stock has been rising fast since he moved to the bullpen full-time. His velocity has ticked up working in relief, especially this season, and he is missing considerably more bats. His velocity has varied slightly from outing to outing, sitting 92-95 mph and topping out at 96 mph in one outing and sitting 94-97 mph in the other two outings. When he is commanding the pitch down, it will show bat-missing ability, but when he misses location it is hittable, even with plus-plus velocity. Buttrey’s changeup has been his go-to secondary pitch, flashing plus potential at 84-86 mph. The pitch looks like a fastball until it falls off the table late. In the most recent outing I scouted, he showed how devastating the pitch could be, burying one down in the zone after four straight 95-plus mph fastballs and completely fooling the hitter. 6/22 Cup of Coffee: Potential injuries to Rusney Castillo and Nick Longhi cast a cloud over Wednesday's games, but there were still some good performances from around the system. Ryan Court and Tzu-Wei Lin (pictured) had terrific days at the plate, while Trey Ball and Marcus Walden had strong starts in the upper minors. A five-run ninth inning rally pushed the IronPigs past the PawSox. Marcus Walden had a good bounce-back performance, striking out six over six innings while allowing only one run. Brandon Workman followed with two scoreless innings, striking out four. Ty Buttrey surrendered four earned runs after walking three and allowing a hit in the ninth, picking up his first loss as a member of the PawSox. Click through for the links and in-site player! 6/21 Cup of Coffee: Michael Chavis (pictured) provided all the offense and a stellar play on defense to earn MVP honors in the Carolina League All-Star Game in front of the home crowd in Salem. Three Drive players saw action in the South Atlantic League All-Star Game. 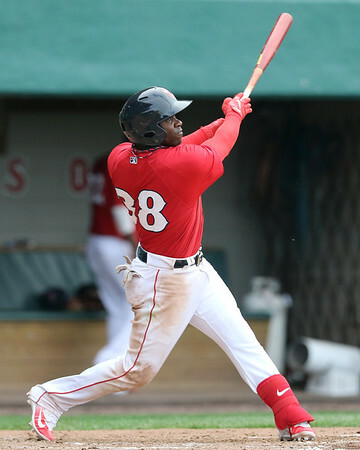 Rusney Castillo racked up another multi-hit game in Pawtucket's loss. Danny Mars led an 11-hit night for Portland, but the Sea Dogs still fell. 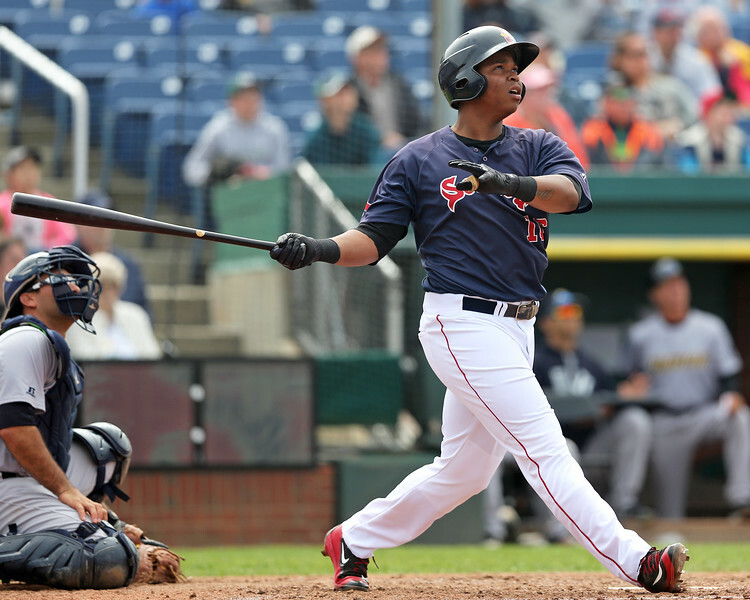 Lowell resumed its suspended opener and played a second game, getting key hits from Yoan Aybar. Rusney Castillo continued his torrid June with three more hits in Tuesday's loss, raising his average to .309. He was the only highlight on the offensive side, however, as just one Pawtucket runner got past second base all night. Jalen Beeks was charged with the loss, but posted his third straight quality start. He allowed three runs on four hits in 6 1/3 innings of work, walking three and racking up nine strikeouts. 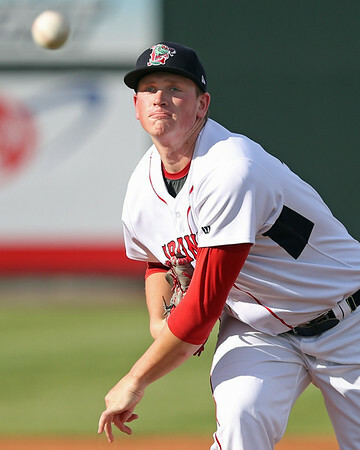 6/20 Cup of Coffee: The Lowell Spinners kicked off their 2017 season on Monday, with rehabbing left-hander Jay Groome (pictured) on the hill. Groome was cruising into the third inning when the game was suspended by rain. The PawSox were shut down by a one-time phenom, while more rain temporarily interrupted a Sea Dogs slugfest that saw home runs from Rafael Devers and Nick Longhi. Salem got some attention Monday night as the Carolina League's top players descended on the city for the start of All-Star festivities, with the home run derby taking place on Monday night. Former first overall pick Mark Appel (PHI) shut down the PawSox, who collected only five hits on the night and did not advance a player past second base until the ninth inning. Allen Craig picked up three of those hits, all singles, to raise his average to .265. A 16-game hitting streak came to an end for Rusney Castillo, though the center fielder did walk and steal a base. Shawn Haviland surrendered three solo home runs, giving up five runs in total in six innings. He struck out six without issuing a walk. Josh Smith fired three shutout innings of relief, allowing only one hit. The first-half wrapped up this past weekend for both full-season A-ball leagues. In each league, the first half winner gets an automatic playoff spot. The Greenville Drive and Salem Red Sox both had a shot at the first-half title for their respective leagues going into Sunday. Greenville was able to wrap up the title with a 4-3 win over the Rome Braves finishing the first half at 41-28. It will be the Drive's first playoff appearance since 2010. 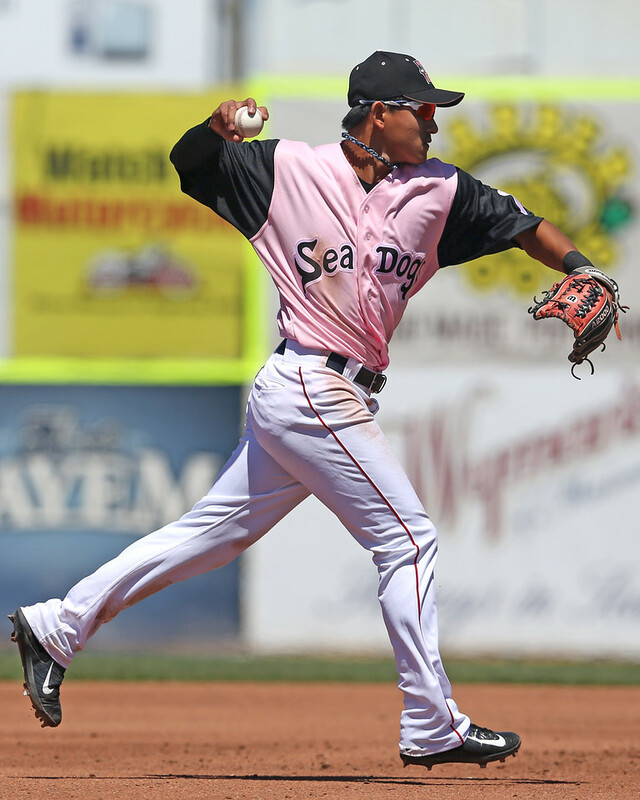 Salem fell just short after dropping both ends of a doubleheader to the Wilmington Blue Rocks. Salem's two losses actually put them into a tie for the best record (40-29) with the Lynchburg Hillcats, but Lynchburg ultimately takes home the title with a 7-6 lead in head-to-head matchups. Salem can still earn a playoff berth by either winning the second-half title or if Wilmington also wins the second-half and Salem finishes with the best wild-card record. SoxProspects.com Director of Scouting Ian Cundall has seen his fair share of Portland games this year, and this morning he came out with his latest edition of Scouting Scratch, covering some quick hits including top prospect third baseman Rafael Devers. Top-ranked pitcher Jason Groome (pictured, right) returns to action tonight pitching on a rehab assignment for the Lowell Spinners. Groome last pitched on April 10th and MLB.com calls him first the pitcher to watch for the day in his first start since. The Boston Globe's Alex Speier said that while Groome has not spent much time on the mound since signing, he has impressed off the field, showing a true professional commitment which was a pre-draft area of concern that allowed him to drop to the Red Sox at 12th overall. With Red Sox third basemen still struggling, the calls for Rafael Devers to come up to the big leagues will only continue to grow. After seeing Devers for three games recently, however, it is clear he still could use seasoning in the minor leagues. Devers can get pull-happy and overly aggressive hunting fastballs. As a result, he can be susceptible to off-speed pitches and extend his zone, chasing them. Even when he briefly falls into such streaks, Devers has the mentality and ability to turn things around quickly. He has shown this ability recently—after an 8-for-48 stretch over his final 12 games of May (.167/.226/.292, 1 HR), he is hitting .364/.397/.764 with 5 home runs. The minor league all-star breaks are upon us—the Single-A break is happening now, while the Eastern League’s game will be on July 12. Considering Michael Chavis’ continued assault on Carolina League pitching, it would not be a surprise to see the two promoted over the next month or so. Moving Devers up to Pawtucket would provide a further challenge for him, especially if the Red Sox are considering him as an option to fill the third base void at some point late in the season. Nick Longhi has always shown an intriguing hit tool, but faced questions about whether he would hit for enough power for his bat to play at first base—questions that led to his retooling his swing during the offseason to generate more lift. After a frustrating April in which he hit just .182/.194/.288 with 1 double and 2 home runs—albeit with a .185 BABIP, suggesting extremely poor luck—he appeared to revert back to his typical self in May, hitting .290/.353/.376 with 5 doubles and one home run. But in June, Longhi seems to be turning the corner. He is hitting .309/.367/.564, slugging 8 doubles and 2 home runs in 15 games. 6/19 Cup of Coffee: The Drive clinched the Southern Division first-half title, but Salem saw their chance at a title slip away. Both Blake Swihart and Nick Longhi (pictured) launched home runs, while Henry Owens and Travis Lakins had successful starts despite some control issues. Rusney Castillo continued to hit well, and Mitchell Gunsolus knocked in the winning run for Greenville. 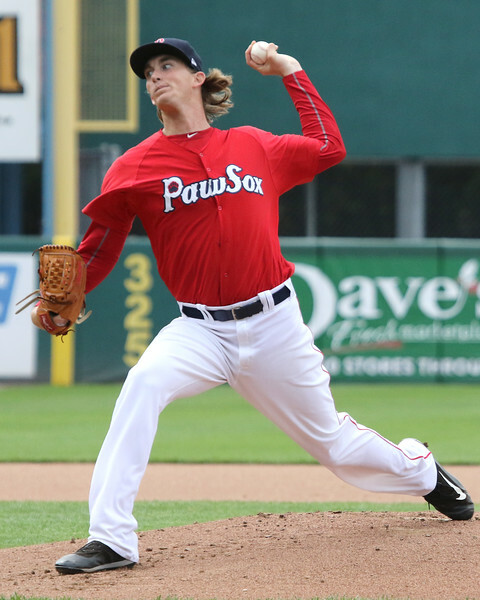 After some early trouble, Henry Owens settled into a groove, but it was not enough for the PawSox. He allowed two runs on three hits with three walks over the first two innings, but then retired 14 batters in a row. He finished with seven innings of two-run ball with four walks and five strikeouts. 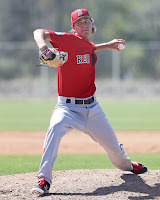 SoxProspects.com Director of Scouting Ian Cundall tweeted that Owens was pitching mostly off his curveball and changeup when he was having success. Kyle Martin took the loss after allowing a solo home run in the top of the eighth. 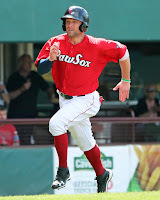 6/18 Cup of Coffee: The PawSox split a doubleheader as both Jantzen Witte and Bryce Brentz (pictured) hit big home runs. Rafael Devers also went deep for Portland, while both Salem and Greenville will be going down to the wire in their playoff chases. A walk-off home run from Jantzen Witte completed the comeback for the PawSox. They did not have a hit entering the seventh inning, but a Steve Selsky single followed by a Bryce Brentz double tied the game, and Witte won it with his second home run of the season. Kyle Kendrick allowed only one run over five innings, and Noe Ramirez picked up the victory with three scoreless innings, striking out three. 6/18 Cup of Coffee: Greenville broke out the lumber in a big way, slugging three homers in a 14-run attack. Jake Romanski had three hits for Portland in a loss. The PawSox and the DSL Red Sox were both rained out. 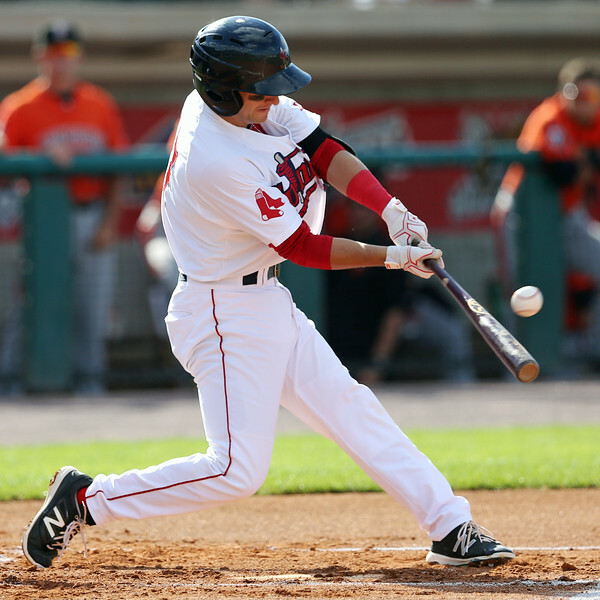 The PawSox were rained out and will have a pair of doubleheaders this weekend. The first will start at 4:35 tomorrow and the second at 12:35 on Sunday. The Sea Dogs jumped out to a 2-0 lead but could not hang on as Jacob Dahlstrand gave up three earned runs in 4 2/3 innings on four walks, four hits, and four strikeouts. Taylor Grover also struggled in relief. Jake Romanski had three hits and Rafael Devers roped his 17th double of the year and drove in a run. Mike Olt reached three times with two hits, a walk, a run, and an RBI. 6/16 Cup of Coffee: Only one affiliate took home a win on Thursday, as Rusney Castillo and a returning Deven Marrero powered the PawSox. Greenville fell out of first place in their playoff race despite a big game from Roldani Baldwin, while Salem lost its contest but maintained its two-game lead. The PawSox are over .500 entirely due to their dominance of the Chiefs - they are 11-2 against their North Division rival, and only 22-27 against the rest of the International League. 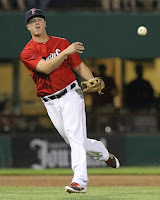 On Thursday they handed the loss to old friend Sean O'Sullivan (WAS), as Rusney Castillo carried the load offensively. The center fielder was 3 for 4 with two home runs and a double, extending his hitting streak to 12 games. 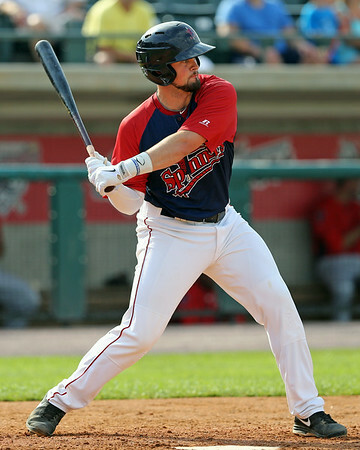 Deven Marrero reported back to the PawSox after a six-week run in the major leagues, and promptly recorded a pair of doubles. On the mound, Jalen Beeks allowed two runs on five hits in 6 2/3, striking out four against one walk. Promoted from Portland earlier in the day to take the roster spot of Boston-bound Austin Maddox, Josh Smith went 2 1/3 hitless innings to earn the save. It was an extremely busy week with the 2017 MLB Draft taking place this Monday through Wednesday. The Red Sox made 40 selections and you can find them all on our draft page. 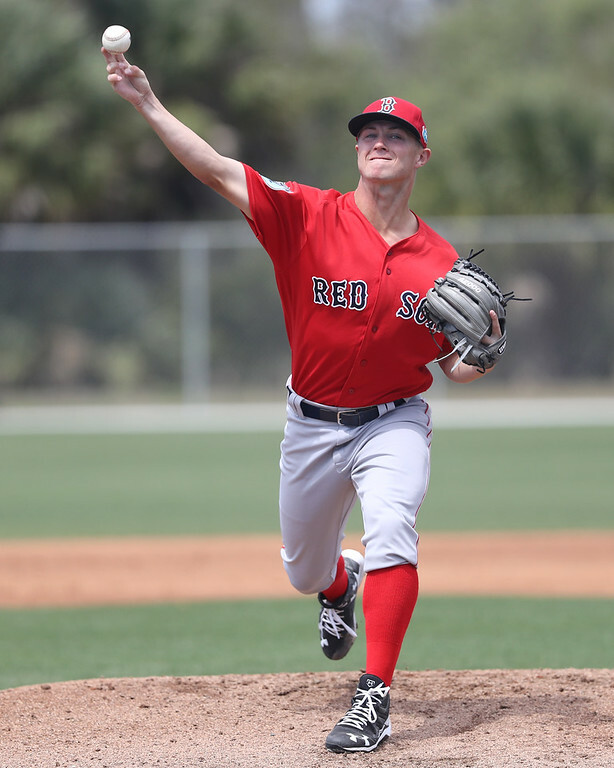 On day one of the draft, the Red Sox selected Tanner Houck (pictured, right), a right-handed pitcher from the University of Missouri, and with their second round pick they took outfielder Cole Brannen, an outfielder out of The Westfield School in Perry, Georgia. SoxProspects.com Executive Editor Chris Hatfield and Director of Scouting Ian Cundall burned the midnight oil on Monday, staying up after the draft to record a podcast with their initial thoughts on the Red Sox first two picks, Houck and Brannen. The Red Sox were elated to land Houck, who they didn't think would still be on the board at 24, area scout Taylor Gold told The Boston Globe's Alex Speier. Gold goes on to say that Houck's progress with the slider this season means the Red Sox think he could have a future as a starter and will develop him as one. Brannen worked extremely hard to achieve goals such as playing in the Under Armour All-American game and being drafted. It means that his decision to switch from shortstop to the outfield was all worth it as Wynston Wilcox wrote for The Telegraph last year. Of the 40 Red Sox 2017 draft selections, 10 were ranked in the Baseball America Top 500, 10 in the Perfect Game Top 500, and 6 in the MLB.com Top 200 list. 12 Red Sox selections appeared in at least one of the lists, down from 19 in 2016. See below for a listing of the 2017 Red Sox draftees who were ranked by BA, PG, or MLB.com. The full list of this year's draft selections can be found over at the SoxProspects.com Draft History page. On day three of the draft, the Red Sox looked to fill in some of the depth in the lower minors while looking for talents who might have breakout potential. Chandler Shepherd and Jalen Beeks, both taken in 2014, are recent examples of day-three talent knocking on the door of the major leagues. The team signed only 12 of its 30 day-three picks last season, a big step down from the 20 signed in 2015 and 18 in 2016. It is likely that this year's class will see a number closer to the latter ones. Colon is a 6-foot-1 middle infielder whose best asset is his speed, having run a 6.70 60. His defensive footwork is advanced and he displays an aggressive approach at the plate. He has a commitment to Jefferson College. MLB teams re-drafted 12 former Red Sox selections in the 2017 June draft. This is up from 11 re-draftees in 2016, and nine in 2015. Two prominent 2017 first-rounders, David Peterson and Jeren Kendall, had been drafted in the later rounds of the 2014 draft by the Red Sox during their senior high school seasons. Jordan Wren, son of Red Sox Senior VP of Baseball Operations, was drafted once again by Boston, this time in the 10th round after turning them down as a junior and 36th round selection in last year's draft. Now that the 2017 First-Year Player Draft is in the books, the signing period is upon us. This year's signing deadline is 5:00 pm ET on July 7, 2017. As most of our readers know, each team's spending on draft pick bonuses is capped. The bonus cap is determined by the number and placement of each team's selections. The bonus cap sets an aggregate limit for a team to spend on its selections in the first ten rounds, and also limits teams from spending over $125,000 on players taken after the 10th round (the excess on any late-round bonuses will count against the bonus pool). Boston's cap is $5,667,100 this year. If the club exceeds its pool: (1) by 0-5%, it will be charged a 75% tax on the excess; (2) by 5-10%, it will pay the same tax and will also lose its first-round pick next season; (3) by 10-15%, it will be charged a 100% tax on the excess and lose its first- and second-round picks next season; and (4) by more than 15%, 100% tax on the excess and lose its next two first-round picks. 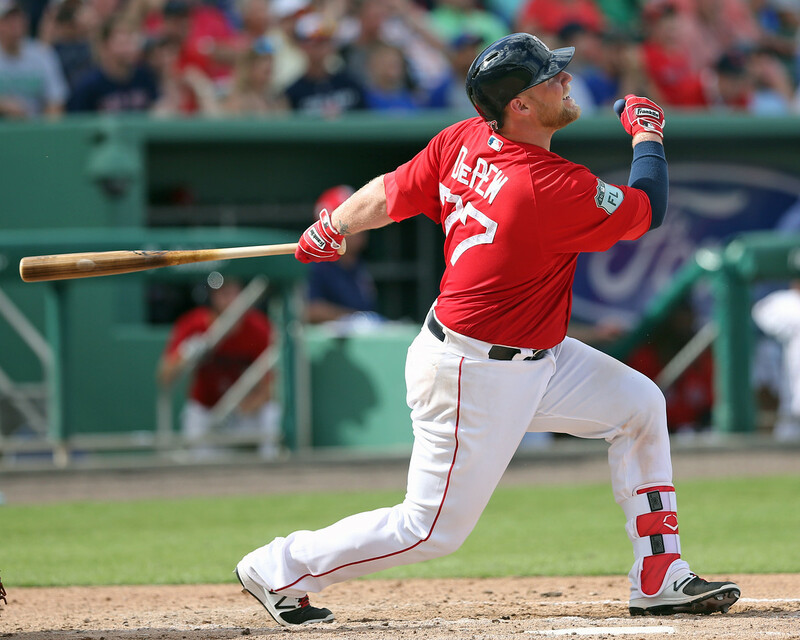 6/15 Cup of Coffee: Both Bryce Brentz (pictured) and Rafael Devers continued their recent hot streaks, as both players had a home run and a double on Wednesday night. The Pawtucket and Greenville bullpens blew late leads, while the Portland bullpen was able to shut down the Curve. A three-run eighth inning was enough for the Chiefs to come back and beat the PawSox. Shawn Haviland got the start and allowed four runs, three earned over 5 1/3 innings. The PawSox took a 6-4 lead into the eighth, but Ty Buttrey gave up two quick hits and Kyle Martin came in and gave up a walk and a go-ahead double. 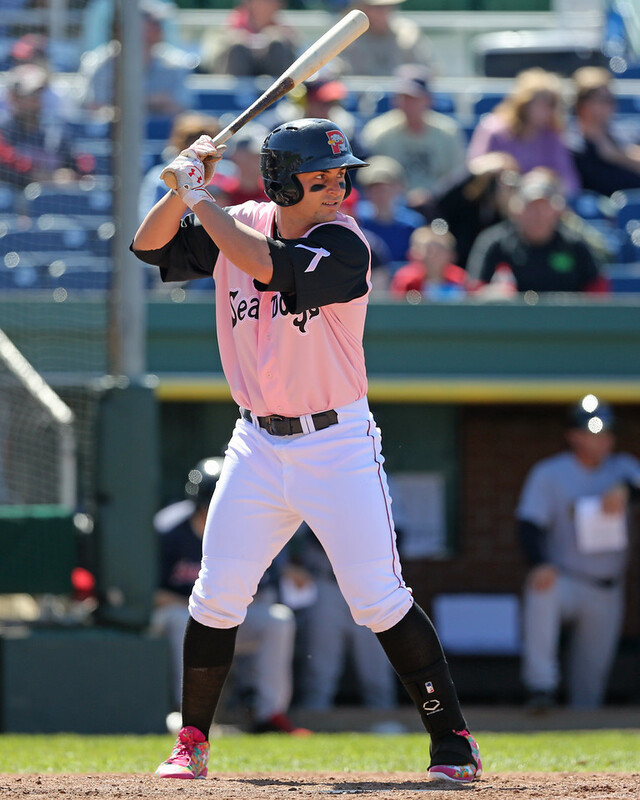 6/14 Cup of Coffee: Bryce Brentz (pictured) paced the PawSox in both games of a doubleheader. 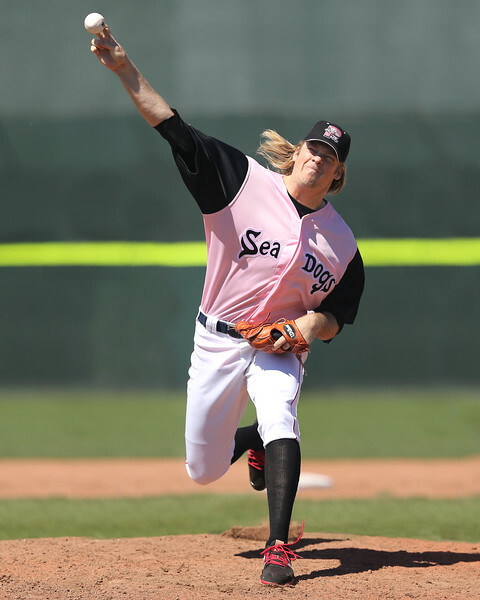 Travis Lakins showed improvement in his latest start for Portland but suffered another loss. Michael Chavis showed signs of being human in a hitless night. Santiago Espinal played hero for Greenville. It was yet another strange outing for Henry Owens as the lefty somehow only allowed one run despite giving up four hits, walking eight and throwing a pair of wild pitches. For the second straight start, he could not escape the fifth inning after reaching 107 pitches in just 4 1/3 innings of work. He escaped jams twice thanks to a pair of well-timed double plays. Bryce Brentz started a great day in game one, going 2 for 3 with an RBI and two runs scored. 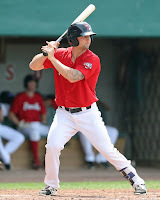 Blake Swihart had a nice game, going 2 for 4 with a double, and RBI and a run scored. He also caught a key runner stealing to help Owens out of a jam. With their tenth-round pick (311th overall) in the 2017 MLB First-Year Player Draft, the Red Sox have selected Jordan Wren, an outfielder from Georgia Southern University. Wren, a 6-foot-1, 185-pound left-handed hitter, played primarily in right field in 55 games as a senior for the Eagles. Wren hit .268/.383/.459 in 194 at-bats for Georgia Southern this year with six home runs, 42 RBI and 24 runs scored. With their ninth-round pick (281st overall) in the 2017 MLB First-Year Player Draft, the Red Sox selected Tanner Nishioka, a second baseman from Division III Pomona-Pitzer. Nishioka was not ranked by MLB.com, Baseball America, or Perfect Game USA. Nishioka hit .441 with 18 home runs and 8 stolen bases across 39 games in his senior season. He has experience playing both middle infield positions as well as center field. A native of Honolulu, Nishioka profiles as speedy utility player. With their eighth-round pick (251st overall) in the 2017 MLB First-Year Player Draft, the Red Sox selected Zach Sterry, a first baseman from Oakland University. Sterry, a 5-foot-11, 225-pound left-handed slugger was not ranked by MLB.com, Perfect Game or Baseball America, although the latter publication listed him as the 10th-best prospect in Michigan. Sterry posted an impressive .346/.441/.643 slash line with 13 home runs and 44 RBI, leading the Horizon League in slugging percentage. He ranked 34th in the NCAA in that category. 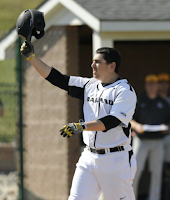 He was an on-base machine for a good portion of the season, reaching safely in 38 straight games from Feb. 24 to May 7, according to GoldenGrizzlies.com. With their seventh-round pick (221st overall) in the 2017 MLB First-Year Player Draft, the Red Sox selected Tyler Esplin, an outfielder from IMG Academy in Florida. He was not ranked by MLB.com, Baseball America, or Perfect Game USA, but was ranked as the 96th-best prospect in baseball hotbed Florida by Baseball America. Esplin is not yet 18 years old but is already a physical presence, measuring at 6-foot-3, 210 pounds. He is a strong-swinging outfielder who moves well for his size and has a good arm. This year for IMG, he hit .432/.535/.716 with 4 home runs, 7 doubles, 15 walks, and 11 strikeouts in 26 games according to Max Preps. He was also named a 2017 Rawlings-Perfect Game Honorable Mention All-American. While he has also pitched as the occasional closer for IMG, he was announced as an outfielder and will focus there. With their sixth-round pick (191st overall) in the 2017 MLB First-Year Player Draft, the Red Sox selected Zach Schellenger, a right-handed pitcher from Seton Hall University. 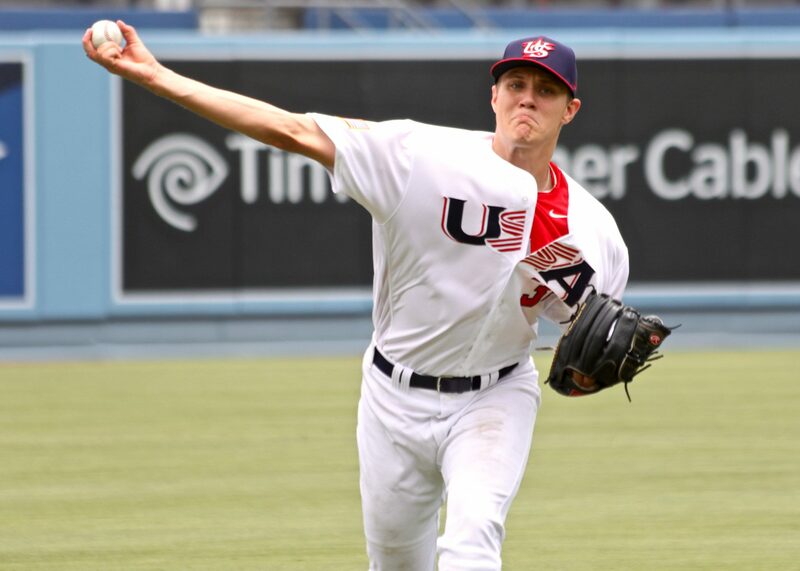 Schellenger, a 6-foot-6 junior, was ranked as the 193rd best prospect in the draft by MLB.com, while Baseball America had him at 195th and Perfect Game USA ranked him at 228. Schellenger logged only 13 innings this season as he missed time with biceps tendinitis, but as a sophomore at Seton Hall, he struck out 70 batters over 45 2/3 innings while recording six saves as the team's closer. He also pitched in the Cape Cod League last summer, striking out 32 over 20 1/3 innings for Harwich while notching six saves. He flashed a mid-90s fastball and plus slider on the Cape, but his stuff took a step back this year before he went down with the injury. With their fifth-round pick (161st overall) in the 2017 MLB First-Year Player Draft, the Red Sox selected Alex Scherff, a right-handed pitcher from Colleyville Heritage High School in Texas. 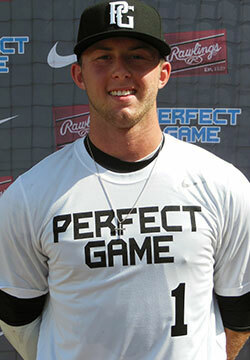 The 19-year-old was ranked 47th by Perfect Game, 52nd by MLB.com, and 59th by Baseball America. Scherff has one of the top arms in the 2017 draft class, stemming from his terrific fastball-changeup combination. The 6-foot-2, 210-pound pitcher has been clocked around 95 mph with his heater, touching 98 mph, and he has confidence in a deceptive changeup. He is also working on both a slider and curveball. MLB.com notes that Scherff lost 40 pounds, helping lead to improved conditioning that allowed him to retain his velocity deep into his outings. With their fourth-round pick (131st overall) in the 2017 MLB First-Year Player Draft, the Red Sox selected Jake Thompson, a right-handed pitcher from Oregon State University. The 23-year-old junior was ranked 71st by MLB.com, 79th by Perfect Game USA, and 83rd by Baseball America. It has been a steady rise for the 6-foot-2, 205-pounder who redshirted his freshman season before missing all of 2015 with a back injury, then returned with mixed results in 2016. He really turned it on in 2017, just as the highly ranked Oregon State team did, finishing the year with the second-best ERA in the country as the Beavers' Sunday starter. Thompson's fastball has always gotten scouts' attention, which Baseball America notes has touched 98 mph, though it sits more 93-94 mph when he starts. MLB.com gives the pitch a future grade of 60 to go with a 55 slider and 50 changeup. It was thought he was best suited to a bullpen role, but that is no longer certain after he simplified his delivery this season (which Baseball America says now compares to David Price's delivery) and lowered his walk rate considerably. The sites agree that the development of his changeup and command will likely determine whether Thompson winds up in the bullpen or rotation. 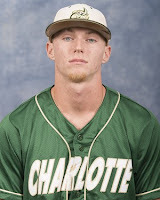 With their third-round pick (101st overall) the Red Sox selected Brett Netzer, a second baseman out of the University of North Carolina at Charlotte. The junior was ranked as the 237th best prospect in the draft by Baseball America, while MLBPipeline.com had him ranked at 197. Netzer is known for his offense, with a quick bat from the left side of the plate that has consistently hit for average during his three years in college. After batting .318 as a freshman, Netzer hit .384 in 2016, though he regressed slightly this season, finishing the year at .342. Over the last two seasons, he has combined to walk 54 times while striking out in only 47 of his 445 at-bats. Both Baseball America and MLBPipeline.com view him as an average defender with a subpar arm and average speed, so most of his value will be tied to his hit tool. The first day of the MLB first-year player draft has passed, with Red Sox picks Tanner Houck and Cole Brannen among the 75 players selected. Boston will have eight picks on Tuesday, beginning with the 101st selection. There are 16 players currently remaining on the board who are ranked in the top 70 of the Baseball America Top 500 and/or the MLB.com Top 200. 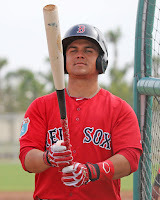 6/13 Cup of Coffee: The first two rounds of the amateur draft took place on Monday night, but 2014 first-rounder Michael Chavis (pictured) refused to be overshadowed as he continues his breakout campaign. Chavis's 17th home run of the season led Salem as its first-half playoff push enters the home stretch. Like Salem, Greenville held onto pole position for a playoff spot with its win. Michael Chavis wasn't about to let newest Red Sox first-round pick Tanner Houck steal his thunder on Monday night. While the Red Sox were preparing to take the Missouri hurler, they were reaping the dividends of their 2014 pick. Of the 17 home runs Chavis already has, a Salem franchise-record 12 have come at home. The newly-minted Carolina League All-Star finished the night 3 for 3 with three runs scored to give him 50 in 54 games. Mike Meyers and Jose Sermo also went deep for Salem. Matt Kent was excellent on the mound, needing only 94 pitches to complete eight innings, allowing two runs on five hits, striking out seven against only one walk. With the win, Salem maintained its two-game lead in the Carolina League's Northern Division with six games remaining on its first-half schedule. With their second round pick (63rd overall), the Red Sox select Cole Brannen, an outfielder out of The Westfield School in Perry, Georgia. Brannen was ranked 54th by Baseball America, 68th by MLB.com, 46th by Perfect Game USA, and 40th by ESPN's Keith Law. Coming in at 6-foot-1, 180 pounds, Brannen is universally praised for his athleticism and Perfect Game grades his speed as plus-plus. Power is not a huge part of his game nor is it projected to be going forward according to Baseball America, but they spoke highly of his bat speed and bat to ball skills, including the ability to take pitches the other way. Despite Georgia being a treasure trove for high school outfielders over the last decade or so, Baseball America says that Brannen has not faced much high-end pitching this spring and thus his approach is still in need of development. He also missed time earlier this spring due to a broken hamate bone. Keith Law noted that he started slowly this spring, but looked like his old self as the year went on and he returned to full health. The 2017 MLB Amateur Draft is underway with 30 players selected so far. The two-way player has dominated all talk surrounding this year's draft, but it was high school shortstop Royce Lewis who was taken number one overall by the Minnesota Twins. High school phenom Hunter Greene, who has first round talent on the mound and at the plate, was selected as a pitcher by the Cincinnati Reds. Brendan McKay, who won the 2017 John Olerud Two-Way Player of the Year Award for a third consecutive season, currently has a 1.121 OPS with the bat and a 2.34 ERA on the mound. He was selected by the Tampa Bay Rays and is expected to hit and pitch in their minor league system. Between Greene and McKay, the San Diego Padres took another high school arm in left-hander Mackenzie Gore from Whiteville High School in North Carolina. Eight of the first 14 picks were high school players. With the 24th overall pick in the 2017 MLB First-Year Player Draft, the Red Sox have selected Tanner Houck, a right-handed pitcher from the University of Missouri. 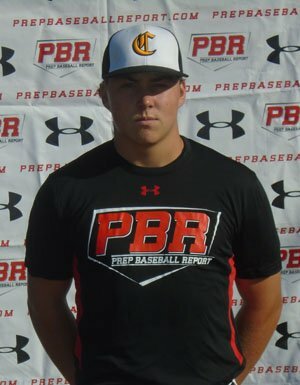 Houck has been rated as a consensus top-30 player in the draft, ranked 22nd by Baseball America, 20th by MLB.com, and 26th by Perfect Game. Houck was previously selected in the 12th round of the 2014 draft by Toronto, but they could not sign him away from his commitment with the Missouri Tigers. At 6-foot-5, 215 pounds, he has the prototypical pitcher's build that the Red Sox tend to favor with amateur pitchers, though his low three-quarters arm slot limits his plane. His best pitch is a fastball that sits in the 90 to 94 range and has touched 98 with a natural sink that some scouts have rated a 70 per Baseball America. His secondaries lag behind the fastball, with a slider that flashes plus potential but can "get sweepy" per MLB.com, and a change-up that currently rates as fringy. Houck pounds the strike zone consistently, posting fewer than 2.5 walks per nine innings during his time at Missouri. In 2017, Houck has 95 strikeouts and 24 walks, and has surrendered only five home runs on his way to a 3.33 ERA. He joins Max Scherzer, Aaron Crow, and Kyle Gibson as hurlers out of the University of Missouri to be selected in the first round. 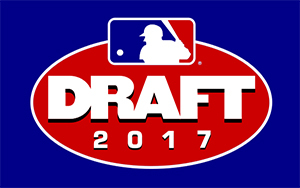 The MLB First Year Player Draft is here and SoxProspects.com has you covered. Check out the full Red Sox draft preview here and all the latest draft news. With the Red Sox once again picking in the later part of the first round, as was often the case in the 2000s, Brian MacPherson of the Providence Journal wrote that Boston needs to "be prepared for a variety of scenarios to unfold." Alex Speier of the Boston Globe also provided his breakdown of how the 2017 draft might go for the Red Sox. 6/12 Cup of Coffee: There were standout performances at all levels yesterday, with Michael Chavis and Bryan Mata continuing their hot streaks, while Jake DePew (pictured) launched a clutch home run for Portland. Chad De La Guerra, Danny Mars, and Josh Ockimey also had good days as they continued to pad their already impressive stat lines. The Pawtucket pitching staff held the Bisons to three hits as they squeaked out a one-run victory. Marcus Walden improved to 6-2 on the season with six innings of one-run ball, allowing only two hits while striking out three. This was his fifth straight appearance where he earned a victory, with three of those coming out of the bullpen. Kyle Martin allowed only a solo home run over his two innings of work, and Austin Maddox picked up his first save with the PawSox with a scoreless ninth. 6/11 Cup of Coffee: It was a lean night for the system, as Portland was the only team to come away with a victory. There were poor offensive showings across the board, as the other four teams managed to score just six runs between them. Pawtucket received some strong pitching but was ultimately shut out. Both Greenville and Salem lost by six, while the DSL squad staged a late comeback attempt, but came up short. Hector Velazquez threw six scoreless innings, but the Pawtucket offense was unable to back his strong effort. Velazquez surrendered five hits and walked just one while striking out four. Jamie Callahan took the loss out of the pen, allowing three runs in two innings of work. SoxProspects.com's own Ian Cundall was at the game and offered a look at Velazquez, as well as Callahan and Ty Buttrey's perfect ninth out of the pen. The Paw Sox managed just six hits on the night, though both Rusney Castillo and Sam Travis each went 2 for 4 with Travis adding a double to the effort. Allen Craig and Mike Miller collected the other two hits for Pawtucket. 6/10 Cup of Coffee: Besides the DSL Red Sox, everybody went home with a victory last night. Solid pitching was a major theme, as Jalen Beeks, Roniel Raudes, and Kyle Hart (pictured) each turned in terrific starts. Nick Longhi blasted a walk-off home run for Portland. Jalen Beeks impressed during his second Triple-A start, picking up his first win. He went six innings, allowed just one run, struck out eight, and walked only one. Austin Maddox and Noe Ramirez finished it off with a combined five strikeouts in three shutout frames. Ryan Court paced the offense with a double, a triple, and three RBI. Mike Miller went 3 for 4 and Sam Travis was 0 for 3 with a walk in his first game back with Pawtucket. Portland walked off in a back-and-forth affair when Nick Longhi belted his fourth homer of the season in the bottom of the ninth with two outs. Josh Tobias went 2 for 4 with a three-run homer, Jeremy Barfield had three hits, and Rafael Devers went 1 for 5 with a two-run double. Teddy Stankiewicz tossed a quality start by allowing three earned runs in six innings. He punched out eight and walked three. Josh Smith picked up the win in relief with five strikeouts in three innings. It’s that time of year again! The MLB Draft gets underway in a few days on the evening of Monday, June 12. Day One will include the first, supplemental, second, and competitive balance rounds. Day Two will be Tuesday, June 13, covering rounds three through 10, and Day Three will be Wednesday, June 14, covering rounds 11 through 40. In connection with this draft, the Red Sox have an opportunity to start to replenish a farm system that has been depleted over the last couple years due to trades and prospect graduations. At SoxProspects, we’ve been covering the draft in depth since 2005. During that time, the team’s best selections have included Jacoby Ellsbury (2005, 1st round), Clay Buchholz (2005, supplemental 1st), Justin Masterson (2006, 2nd), Josh Reddick (2006, 17th), Anthony Rizzo (2007, 6th), Christian Vazquez (2008, 9th), Alex Wilson (2009, 2nd), Jackie Bradley (2011, supplemental 1st), Mookie Betts (2011, 5th), Travis Shaw (2011, 9th) and Andrew Benintendi (2015, 1st). They’ve also been successful nabbing some relievers, replacement level players, and trade chips over that period. 6/9 Cup of Coffee: There was little to cheer about Thursday night at the major league level, but the Red Sox had an excellent day down on the farm. All four stateside affiliates won their contests with several standout individual performances. 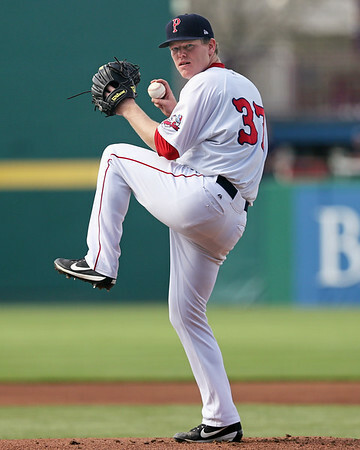 Shawn Haviland (pictured) dominated for the PawSox, spinning a four-hit shutout victory, while Portland had nine doubles as part of its 16-hit matinee. Michael Chavis made his way into the record books in Salem's win, and recently-minted South Atlantic League All-Star Roldani Baldwin led the charge for Greenville. It was a clinic in Pawtucket in every aspect of Thursday's contest. Former Harvard Crimson ace Shawn Haviland turned in the first complete game shutout of his professional career. The 31-year-old allowed only four hits, striking out seven without issuing a walk and inducing 13 ground ball outs. Haviland got plenty of support, as the PawSox reached base 19 times. Blake Swihart scored three runs, going 2 for 3 with a walk and a hit batter. Allen Craig also reached base four times, and Ryan Court delivered his fifth home run of the year. Travis Lakins (pictured) breezed through the Carolina League this year, pitching to a 2.61 ERA while striking out 43 over 38 innings. His transition to the Eastern League has been a rocky one as he has allowed 17 runs over 15 innings. SoxProspects.com Director of Scouting Ian Cundall featured Lakins in the latest version of his Scouting Scratch, and he also uploaded some video from the outing. There were several standout performances in the system in May, and Mike Shawaryn and Michael Chavis were ultimately chosen as the Pitcher and Hitter of the Month, respectively. Senior Staff Writer James Dunne covered their various accomplishments for the month, and both players have also come out hot in June. Shawaryn struck out six over five innings in his first start since his promotion to Salem, while Chavis already has four extra-base hits in seven games this month.